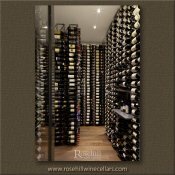 The wall mounted VintageView metal wine racking is installed for floor to ceiling continuation of racks in this residential wine cellar. 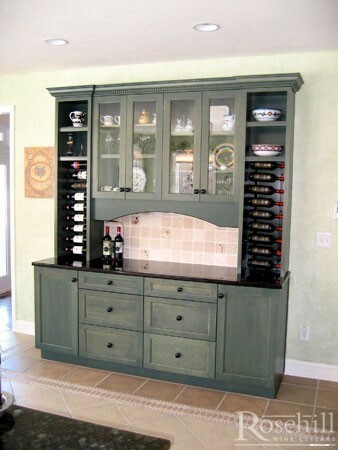 This customized wine cellar is augmented with wood bin style racking below counter top. Half height racks with counter on top are often useful within wine cellars. They allow a place to put wood or cardboard cases for un-crating, rest a wine glass while exploring you collection or looking for the next wine bottle. If you are so inclined, rest a cheese plate on the table and entertain within the cellar itself. Salut. Platinum (Brushed Nickel) Vintage View wine racks are installed to maximise floor space within this contemporary wine cellar. 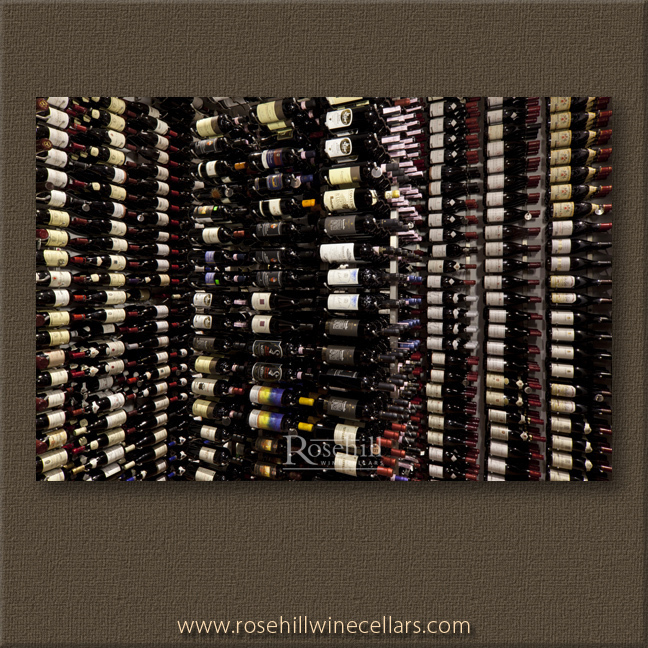 Maximum bottle storage is also achieved by using the triple deep racks. Glass entrance door gives you a glimpse of the treasures within. Custom height FCF allows for stand alone island in this custom modern wine cellar. 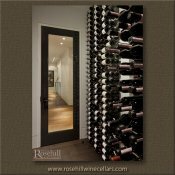 Brushed Nickel Vintage View give this cellar visual impact with all bottles being label forward. 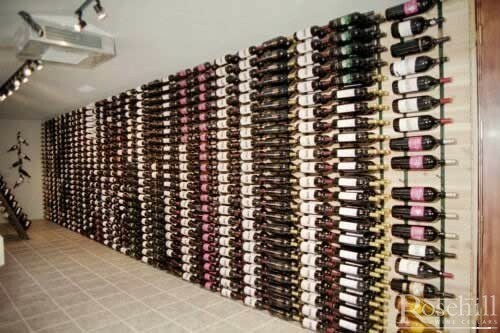 You can really get a lot of bottles into the space using triple deep racking and available floor space. This isn't a photo-shopped image with bottles imported. 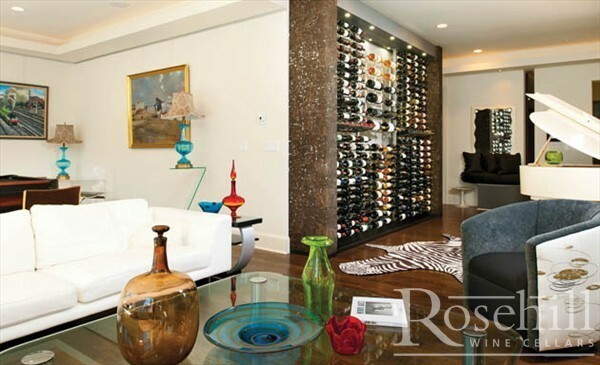 This is Vintage View will mounted wine racks showcasing a spectacular collection. The beauty of the Vintage View line is that the wine is the focal point and at this point you can't even see the racks. The Platinum (Brushed Nickel) finish metal wine racks let the wine be the star. A view from the wine cellar through the glass door alludes to the minimalist design elements throughout the entire house. 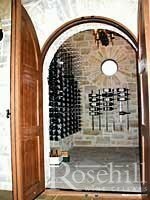 A simple exterior grade insulated glass door protects the wine within this climate controlled wine cellar. Commercial Wine racks with labels displayed to maximize exposure and bottle sales. This freestanding island expands to unlimited lengths and don't need to be fastened to the walls. The 3ft IDR (Island Display Rack) also features the end cap for 360 retail exposure. Modern wine storage room with a more industrial design achieved with black metal wine racks. Black evaporator face plate in the ceiling for the cooling unit. 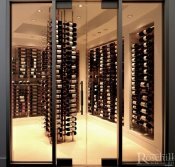 Stun your guests with this beautiful wine cellar with full glass walls, cooled with a WhisperKool Ceiling Mount split system. Wine displayed in Vintage View racking in a very simple but elegant way. We love it! Display the label of wine bottles in wall mounted metal wire racks. 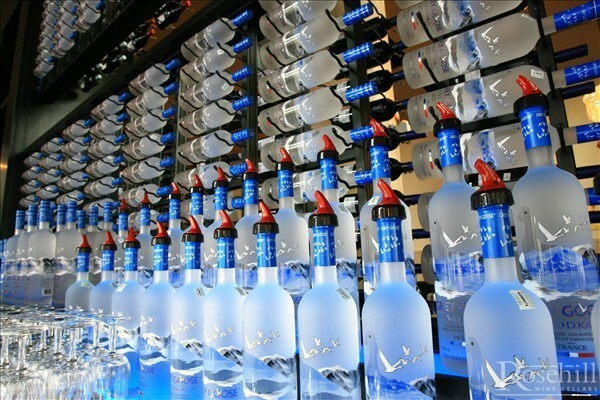 This restaurant showcases bottles of Grey Goose. Available in Black or Platinum (Brushed Nickel) these racks blend into the back ground and are attached to the wall. 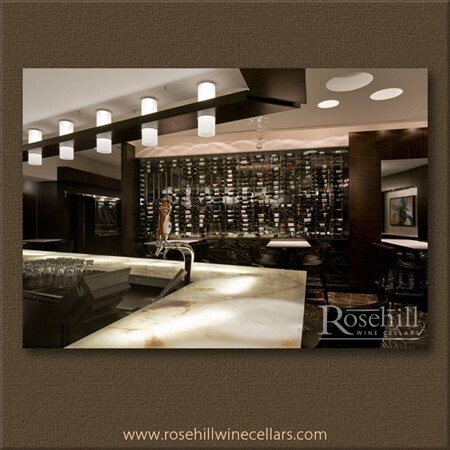 Floor Ceiling Mount metal wine racks allow for visual and spatial separation. This decorative screen is beautiful and functional creating separate eating areas within the restaurant. Often installed adjacent to glass the FCF - Floor to Ceiling Mount wine racks are used when no walls are available for mounting. 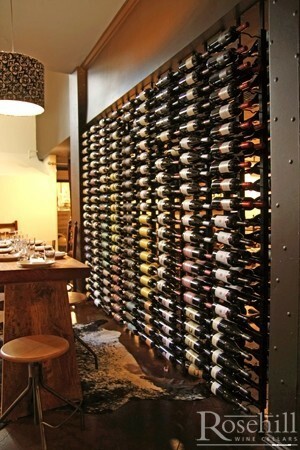 Denver based restaurant, Osterio Marco, features Vintage View metal wine racks to showcase wines offered on their menu. Modern metallic trim surrounds Floor to Ceiling framed racking. Note lower down in the picture the racks appear to be floating off the floor. A clean contemporary look for this Italian restaurant. 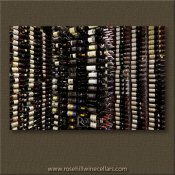 One bottle deep on glass side and three bottle deep on the cellar side allows for maximum storage and display. 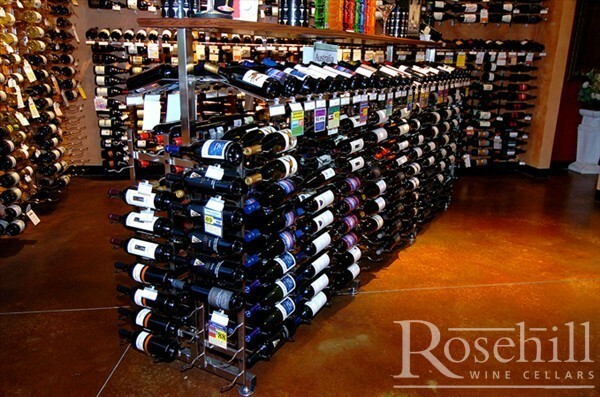 Generally with the Floor to Ceiling racks are installed with only one bottle deep on glass side, also make sure there is enough spacing between the columns when installing these frames to allow hand access for the forward facing bottles. Note the diamond bins in the back of the image allowing for bulk storage in cool white bins. Cool grey, white, black and platinum provide for a clean modern looking wine cellar. Platinum (Brushed Nickel) VintageView wine racks are installed with the Floor to Ceiling mount frames. 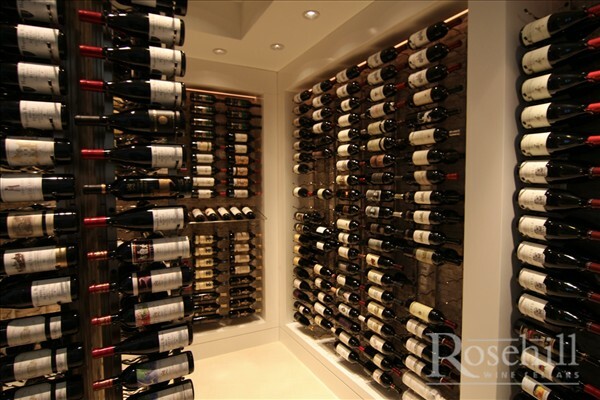 Staggered heights and spacing of racks create visual interest in this walk in cellar. 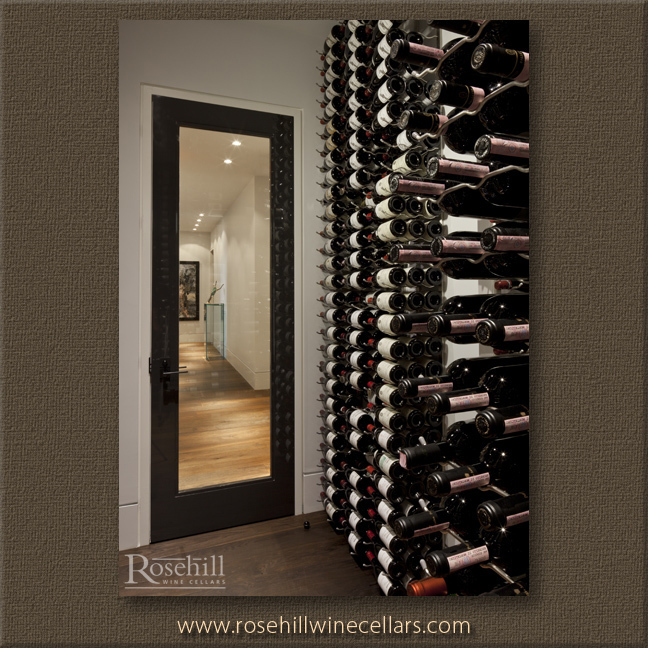 The presentation shelves (PR) at both ends of the cellar allows you to see bottle labels from a different angle. 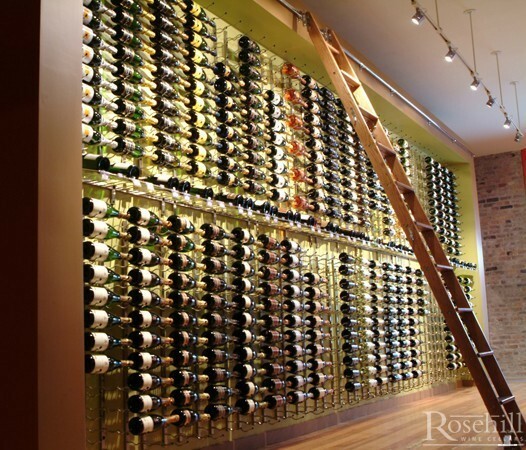 Vintage View Floor to Ceiling wine racks create interesting visual in this glass cellar. Brushed nickel finish matches the adjacent exterior metal trim. Hardwood flooring from main restaurant dining room is continued within the wine cellar. The wall mounted Satin Black VintageView wine racks are installed within recessed niches in the wine cellar. Ductwork and piping were integrated into the cellar using bulkheads and acted as vertical separators for the niches. End cap display shown to the left of the picture uses floor to ceiling mount frames. Presentation rack on back wall displays bottles with different neck orientation. 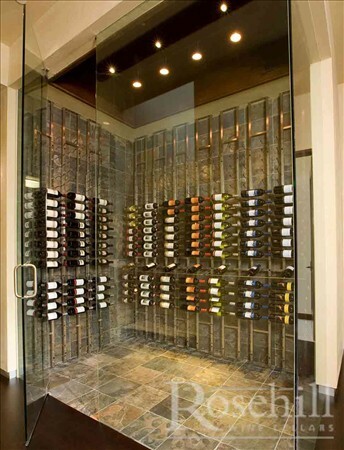 Shiny chrome wine racks are featured in this moderate bottle capacity wine cellar. 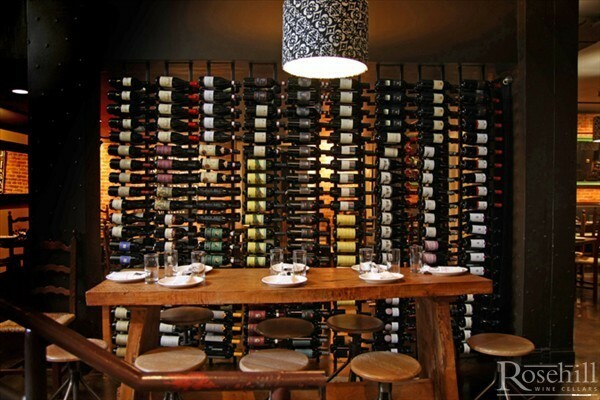 In this case, the Floor to Ceiling mount racks are not fastened to the ceiling instead, the wall brackets are used to secure these taller wine racks to the wall close to the top of the racks. Presentation rack separates upper and lower racking. This Mississauga restaurant features bar height tables for four adjacent to glass wall display. 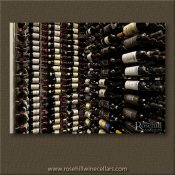 VintageView Floor to Ceiling mount wine racks allow for maximum label exposure. An ideal racking for commercial applications, the label forward racking lets customers' see at a glance what they would like to drink while protecting the owners' investment by keeping inventory in locked climate controlled area. This image features a clean cut natural stone bar. A calming wait station for customers to order a drink prior to dinner or appetizers in a more relaxed environment. 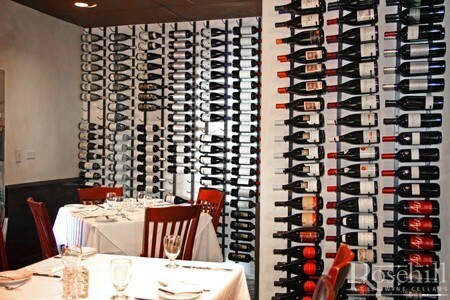 The wine wall in the background blends into the decor of the restaurant. This glass wine cellar is a focal point and key design feature from all areas of the restaurant. The exclusive Platinum Club in the ACC features our Vintage View metal wine racking adjacent to glass. 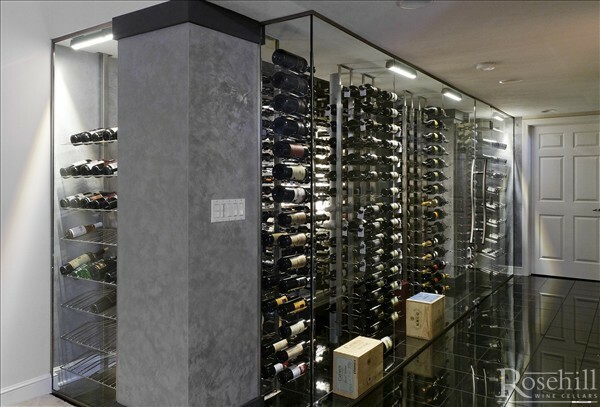 Floor to Ceiling mount allow the wine racks to be installed adjacent to glass. Walnut trim allows for rich and inviting entrance to the Club where you can dine, socialize, watch various sporting events and concerts. Black metal VintageView wine racking adjacent to glass gives patrons a glimpse of what awaits them within Air Canada Centre's Platinum Club. 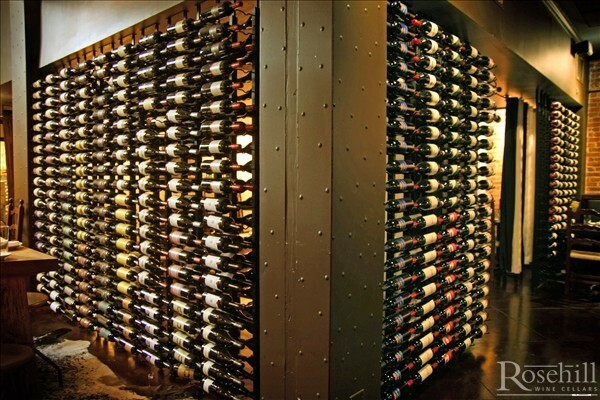 Six columns of wine racks mounted to floor and ceiling are spaced apart to allow easy access to single display bottles adjacent to the glass. 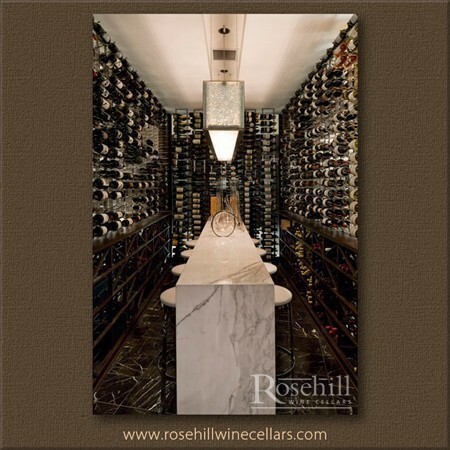 This wine cellar features both wood and metal wine racks for a mix of old world and new world. Wooden diamond bins have been stained dark to offset the stone counter running almost the length of the entire cellar. 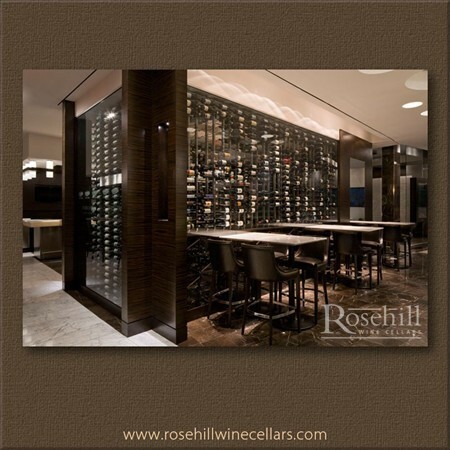 Brushed Nickel finish wine racks are slightly recessed to the heavier bins below. Dark stained wood Diamond Bin wine racks underneath wall mounted metal racking. Bottles are stored with either label out and neck out display. 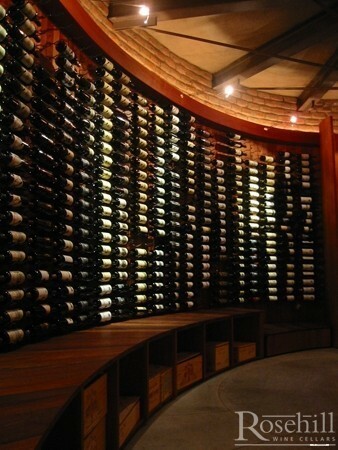 This residential wine cellar also features a long and narrow tasting table. The VintageView Metal wine racks are installed roughly ever 15". This flexibility of install means that these wall mounted racks can be installed in trickier areas. Curved walls are a prime example of where these racks can serve a unique purpose. Wood racks or racks with wider expanse can't accommodate the curvature of some walls. 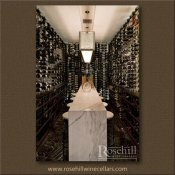 Ceiling detail provides dramatic architectural finishing to this large wine cellar. Commercial metal wine racking proudly displays various bottles at the Apply Valley wine store. Double bottle wine storage on the top separated with presentation rack and triple deep below. IDR - Island Display racks to the right joined together to form longer aisles within retail store. 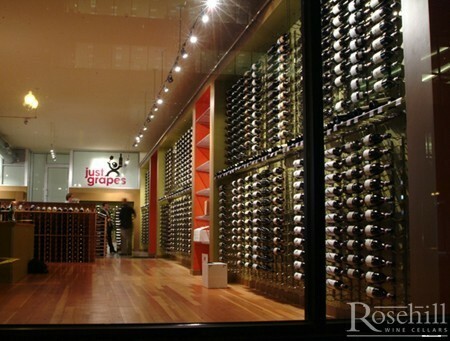 Just Grapes wine store in Chicago, IL features wall mounted VintageView wine racks in recessed niches throughout the store. Presentation racks mixed with traditional display racking allow the wine bottles to be the focal point. 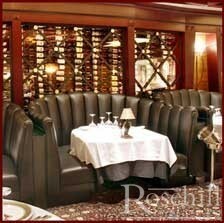 The feature wine walls in this restaurant exude old world elegance when complimented with white linens. These single bottle depth wine racks are spaced fairly close together to maximize bottle capacity in tighter space. Roughly 15" is needed per column of racking. This minimalist decor allows the racking display to shine. Rustic and modern in together to create one great look. This VintageView wine rack display is complimented with metal trim to the side of the niche. The Floor to Ceiling mount frames hold black metal racks without attaching to the wall. Long narrow wooden tasting table with swivel stools and animal print rug lend a coziness to this racking display. 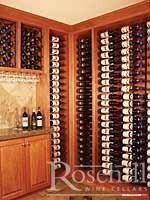 Utilitarian wine cellar with efficient wall mounted metal wine racks. Notice the necks of the bottles are all pointing in one direction. This racking system can be mounted from left to right or right to left. The wine racks can also be mounted so the necks of the bottles are interlaced. The will allow even more efficiency to maximize bottle capacity in the cellar. Ivory & Ebony Accent this Niche Oriented Cellar. 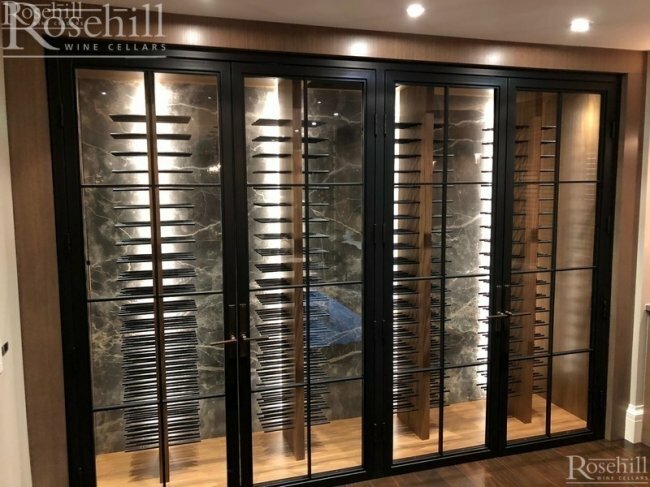 The wine cellar features both wall mounted wine racks and the VintageView Floor to Ceiling Mount Frames to create a square peninsula in the centre of the space. 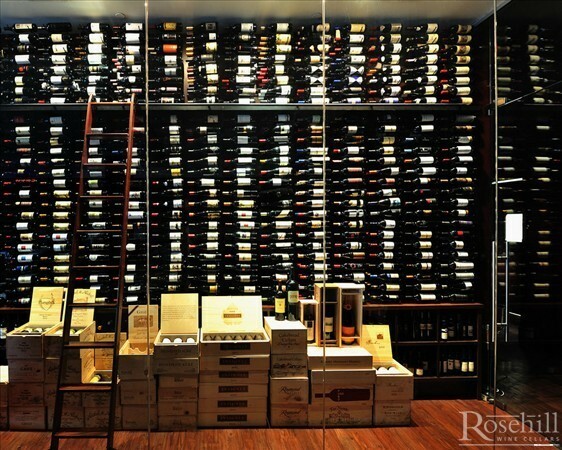 Varying heights of both the racks and the ceiling create visual interest in this unique cellar. 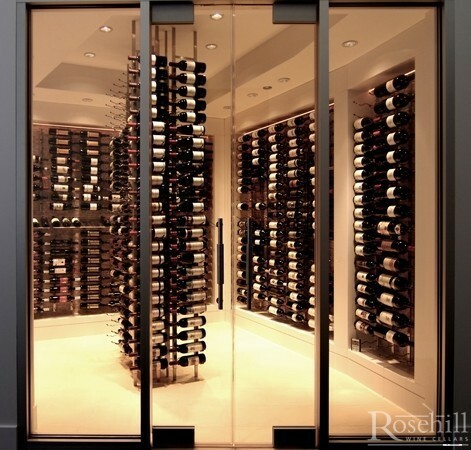 Double doors in glass allows full view of the owners prized wine collection. 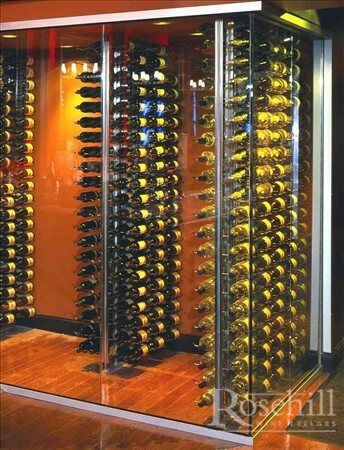 Behind glass, these metal wine racks create a focal point within a restaurant environment. Notice how these racks are recessed deep behind the glass to allow walking space for wait staff to access bottles from the front. 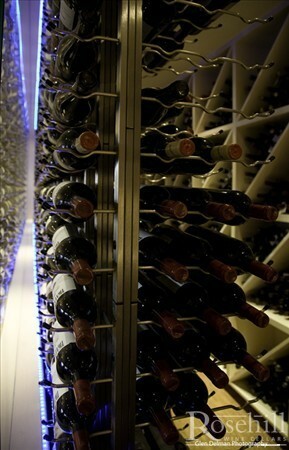 Other wine racking systems will allow the racks to be installed adjacent to the glass for wait staff to access from the back. Create an uncluttered, easily accessible retail display with the these stand alone metal wine racks. The Island Display wine Racks (IDR) are free-standing and come in varying widths and heights. The wine bottle label is the focused with full exposure. 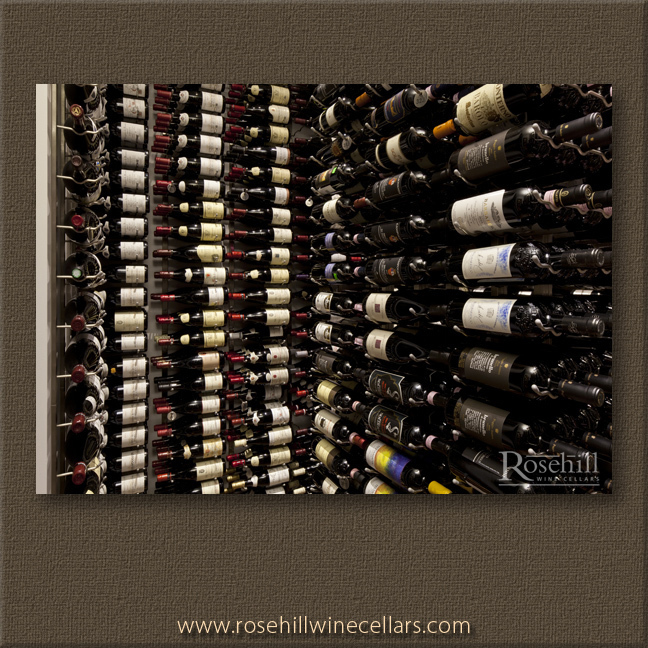 Rustic environment and modern wine racking blend seamlessly and dramatically. Metal Vintage View Wine Racking in platinum finish is installed to look free-floating on brick walls. A nice balance of old world and new world in this residential cellar. The clean lines and label forward design of these wine racks makes for a dramatic presentation in a residential family room. 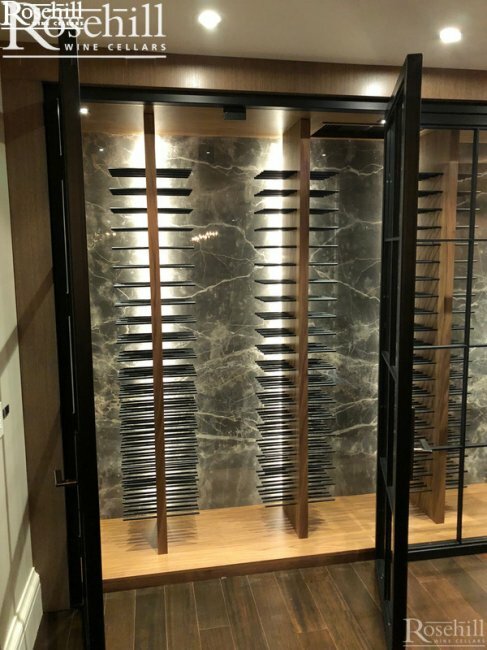 Black metal VintageView wine racking is installed within created cabinetry in warm stain to create visual contrast. Vintage View racks fit into spaces that traditional racking won't. 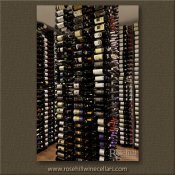 The metal wine racks come standard in 3ft and 4ft height but can easily be cut as needed or stacked to create higher racking displays. 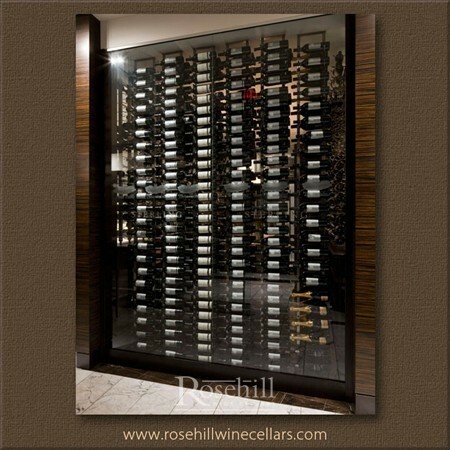 The racking for this dining room cabinet is one deep and holds a total of 18 bottles. Please note, we do not recommend storing wine at standard household temperature, this type of display is for short term storage where you have high turnover of bottles or you need access for a quick grab. 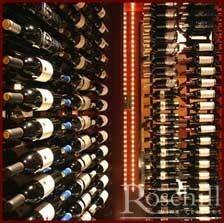 Any wines with long term storage needs should be in a climate controlled cellar. The library ladder on this champagne wall allows easy access to tall racks within this climate controlled retail store. Neck tags half way up the racking allow for pricing and wine details. 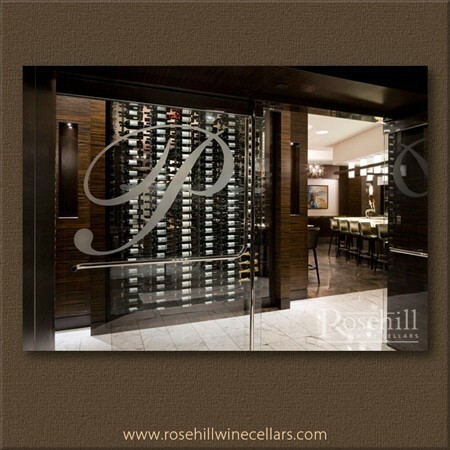 The metal wine racks in Brushed Nickel finish provide a clean look for viewing of wine label. Overhead lighting helps to showcase the wine in its' best light. 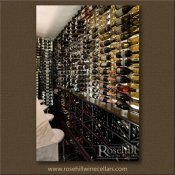 VintageView metal wine racks for wine cellar in El Verano, California, CA. 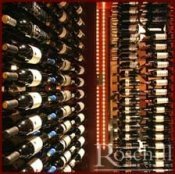 Metal Vintage View Wine Racking installed in restaurant wine cellar. 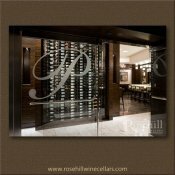 Climate controlled wine cellar in full view of restaurant is protected with glass walls. Customers can relax and enjoy all that the restaurant has to offer. Commercial wine display using Metal VintageView wine racks. 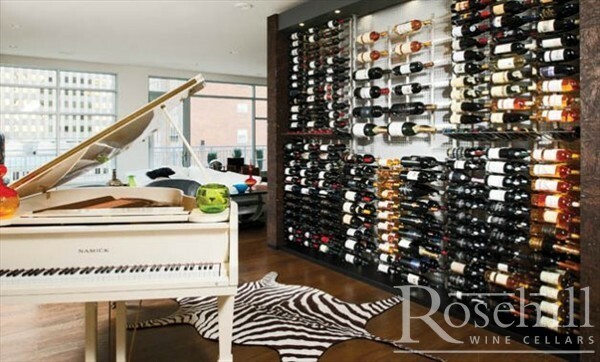 Floor to Ceiling mount wine rack in platinum finish and is shown here with hidden base place. This two bottle depth wine rack is mounted where no wall space was available to affix racks. Commercial setting for the Vintage View Wine Racking. 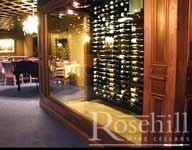 Main floor wine cellar incorporated into one side of the club house, showcasing wine collection behind glass. The Metal Vintage View Floor to Ceiling Mount frames allow the wine racks to be installed adjacent to glass as the racks fasten to the floor and ceiling. The logo sandblasted onto glass entry door for the club house wine cellar. Metal VintageView wine racking is featured in this commercial wine cellar. 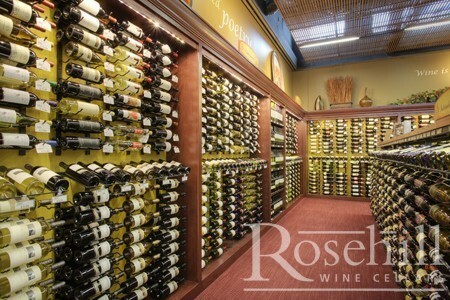 The label out storage of the wine bottles allows patrons to view the collection at a glance. The VintageView system is ideal for restaurant and commercial applications where sales and turnover of wine inventory is important. Nature, sun, sea, moon, knowledge? What are the secrets behind the logo on this sand blasted wine cellar door? The liquid treasures within are safely stored on the metal Vintage View wine racking. 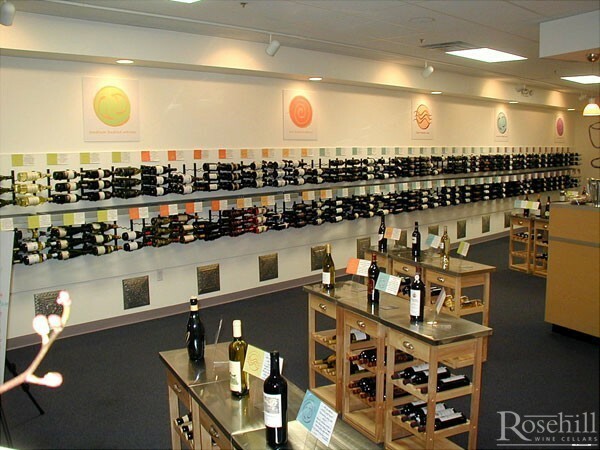 This commercial environment proudly displays the wine bottle labels to showcase their collection. 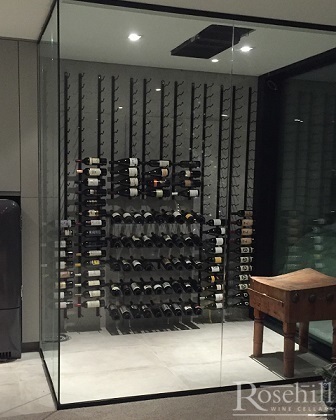 This cellar has used a mix of the wall mounted WS metal wine racks and the FCF floor to ceiling mount racking. 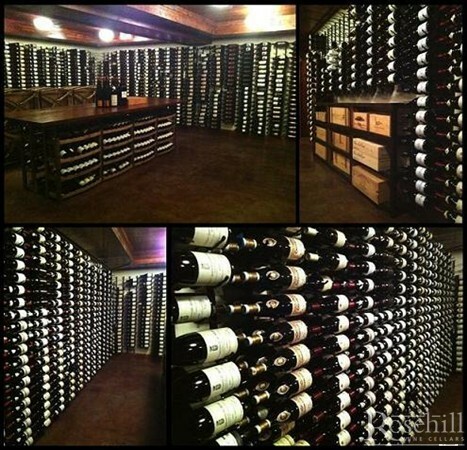 The McCarl's of Pittsburgh, Pennsylvania, PA shared this wonderful cellar with us. 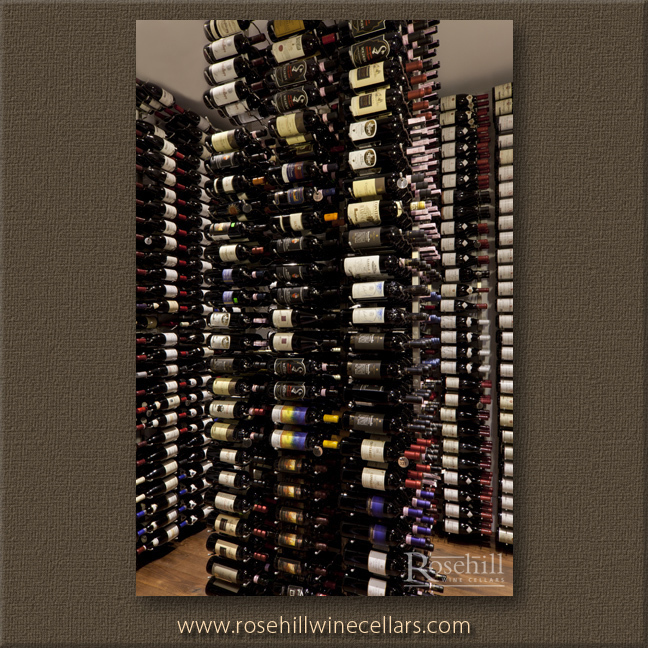 The metal racking system, from Rosehill Wine Cellars, holds 500 bottles. 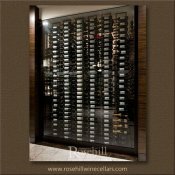 Since the McCarl`s collect young wines, refrigeration wasn't a major concern, but the results look fantastic of this unique wine display. Racking used was the wall mounted metal VintageView racks with magnum display for larger bottles in the center. The McCarl family of Pittsburgh, Pennsylvania, PA installed the Vintage View racking into the main living area of their condo. 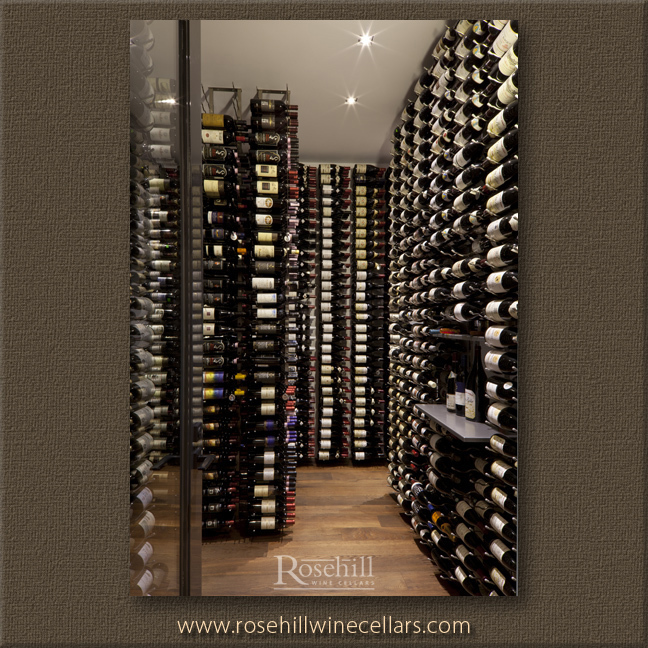 The metal racking system, from Rosehill Wine Cellars, holds 500 bottles. Since the McCarl`s collect young wines, refrigeration wasn't a major concern, but the results look is a unique showpiece area. This photo angle shows the Vintage View racks in multi depth storage with presentation rack part way up the wall. Black metal pegs holding wine bottles parallel when mounted on wood separators. The Wine Pegs will allowing viewing of wine labels when mounted in this fashion. Black metal pegs mounted in front of illuminated marble wall. The Wine Pegs are mounted on wood panels.